As learning and performance improvement consultants and developers, we see trends emerge across the landscape of our client base, despite vast differences in the products and services they offer. We see workforces becoming more dispersed and virtual teams an acceptable norm. We see organizations looking to reduce training costs and accelerate new-hire orientation through online and social learning, as opposed to formal classroom learning. And we see a recognition that we don’t need to force learners to know everything right now; instead, we need to give them the tools and resources to access learning on-demand, when they need it. In today’s busy world, often less is more. It is from that edict that we’ve seen the rise of nano-learning as a core, strategic learning solution. To wrap up, let me share with you a real-world example of how we used nano-learning as a solution for one of our clients. This client, a large financial institution, was merging with another large organization, which needed to bring its existing 10,000 customers onto our client’s online business banking tools. To be scalable and cost-effective, our client wanted to shift from a hands-on trainer model to a customer self-sufficiency model that could support both new and experienced users. Some learners needed to know very specific things (what button do I push now? ), while others needed the soup-to-nuts approach. We created more than 200 one- to three-minute nano-learnings on specific system topics. Some were also combined to form whole courses, with an avatar coach providing the context and “aha!” moments for the learners. The net result of this approach was that our client can provide the same training in multiple modalities, and the customer can select a mode based on the way she learns best or her immediate needs. It also means that when our client needs to go back and make updates (which we know will happen with these systems as they evolve), the updates can be easily re-embedded into the different modalities. Short, scalable, cost-effective, mobile, and on-demand. 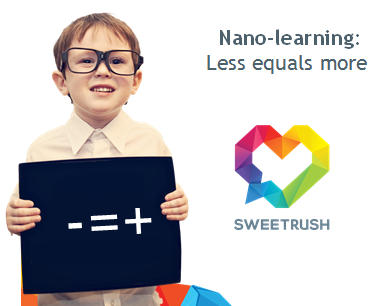 In the case of nano-learning, less is truly a whole lot more.